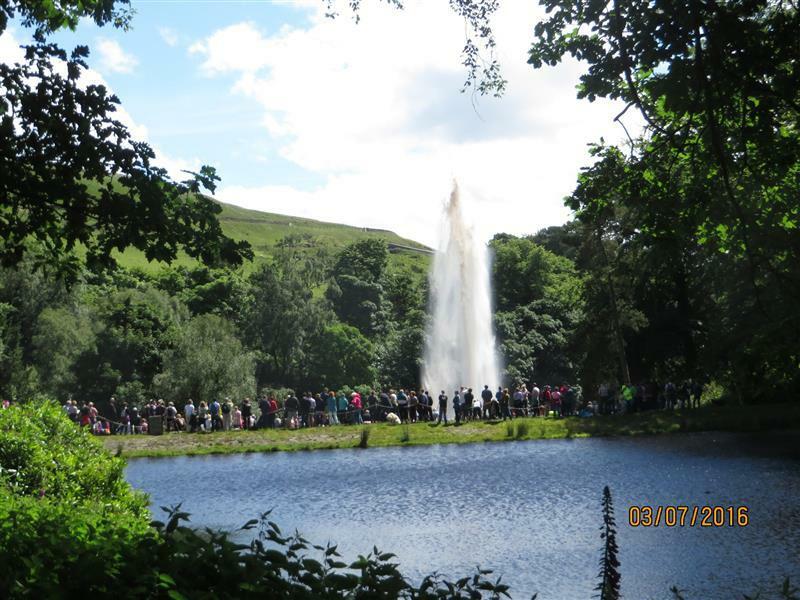 Organised by the Rotary Club of Halifax, and with permission granted by Yorkshire Water and the landowner, th fountain reached upwards, and at its zenith was some some 120 feet in height. The spectacle of the fountain, probably the second tallest gravity fed fountain in England after that of Chatsworth, was viewed by several hundred people. They had set off from the Cat I’th Well Inn at noon enjoying a picturesque walk of nearly two and a half miles via the estate itself to reach the fountain base contained at the centre of a large pond at the lower end of sloping land and hillsides. At 2.00pm precisely an engineer from Yorkshire Water opened the two valves that allowed the upper of three reservoirs on the estate to flow with significant force down a pipe resulting in the fountain and the picture shown. It was a true family afternoon out accompanied by many well behaved dogs. The ruins on the estate of Castle Carr Mansion were visited and inspected by many on the walk. On return to the Cat I’th Well Inn refreshments and a Hog Roast were the order of the day so enjoyment continued for many. As a result of a large attendance Sherri Highley Hammond, Rotary’s organizer, said a figure in excess of £5,000 would likely find its way into local charities and good causes in the coming months.